The better way to make pasta. Have perfectly cooked pasta without any spills or messes. 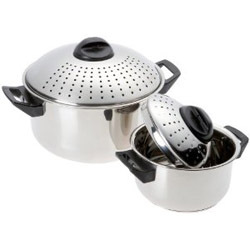 Better Pasta Pots lets you cook pasta without having to pull out a colander to drain it after it's cooked. The lid is the colander! Simply lock the patented quick lock handles in place and drain the pasta. It's that easy! Take the fuss and mess out of cooking pasta! With your help we can reach more people and let them know about Better Pasta Pot whether this product works or not. I think this is a great idea but after the first use the interior finish had a blister. After the third use fully 1/3 of the bottom of the pot has chipped off. Nice idea however just another pot to cook pasta. Not as useful as I thought, but it be useful for people who cook alot of pastas. Fairly sturdy product. This is actually a great idea, and I used it like mad... until the non-stick coating gave way... also the handle on the lid became loose after awhile, making it hard to turn the lid into the "locking" position. Overall, I really liked this pot, but it's relatively short lifetime is a downer. Luckily, it's found cheaply at the 'As Seen on TV' store.